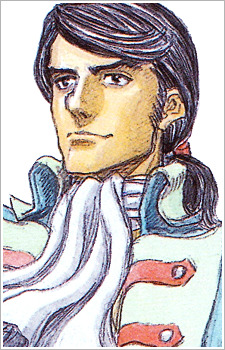 Roderick of Staufen, the third prince of the island nation Eath is the childhood friend of Magnifico and the fiance of Farnese. As a sailor, he sees vast potential in the exploration of the seas, unlike his peers, who focus internally to the point of stagnation. As part of Magnifico's plan to join the Vandimion name with the royal Eath family, Roderick agreed to be Farnese's fiance. His obvious motivations for this arranged marriage are the vast opportunities and support the Vandimion name could bring him, but he seems to take a personal interest in the heiress as well due to her reputation. Roderick has been used as a way for the author to delve into Guts' deeper psyche by asking him questions about himself and Casca. Guts approves of his naval prowess, as indicated in the fight against the pirates. It is not known whether Roderick is in love with Farnese, but he does try to win her affection, even in the delicate matter concerning her own affection for Guts. Roderick, with his long black ponytail, his good looks and devil-may-care attitude, is an excellent charmer and a decent swordsman, and demonstrates a willingness to fight the demons, even though he is ill equipped to take them on. He is currently ferrying Guts and company aboard his ship, on their way to Skellig. Roderick and his crew also have a claim to fame on the high seas: His ship, the Sea Horse, downed 5 Tudor vessels on its own, thus earning Roderick the title of "Prince of the Seas". He and Isidro think very much in the same line in presence of women.